I am including notes on my working through the process and some of my stumbles at the start of this post. More specific how tos are found toward the bottom of it. 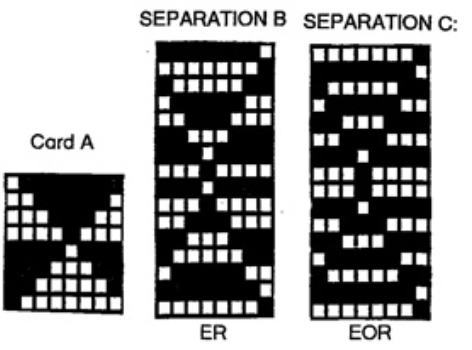 Such fabrics may be created with both the KRC built in function, or with the color separations that knit each color for each design row for 2 consecutive, identical rows. Punchcard knitters are not excluded. 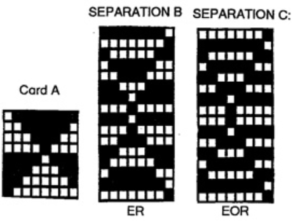 The starting side is on the left for the KRC setting (B in this illustration), on the right side for the alternate color separation (C, double length or drawn with each row repeating X 2). 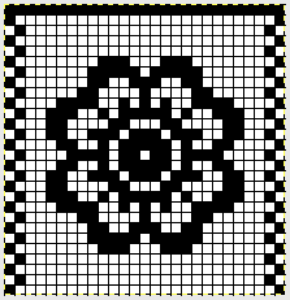 I am still testing my 930, for my samples I began by using the built in pattern #16 in the Stitchworld Pattern Book I. 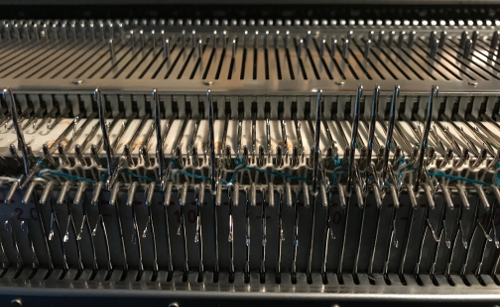 In the absence of a jac40 the fabrics are knit by manually selecting stitches to upper working position (E on Brother) on the ribber bed every row. Preselection for the next row to be knit on the main bed makes the process far easier. In my first sample, the colors are the same on each face. Since the same number of needles are selected for both design and ground, both sides of the fabric will be exactly alike. There will be floats, enclosed by knit stitches of the opposite color. Beds are set at half pitch. Consistency makes any process easier and more predictable. My ribber set up was also with an extra needle on the ribber at either end of those in work on the main bed. I found I had less issue with the long floats in my design when I made certain the needle selection began with needles to the left of those in work on the opposite bed rather than to the right, allowing for the color in use to knit first on the ribber, then in turn on the main bed. 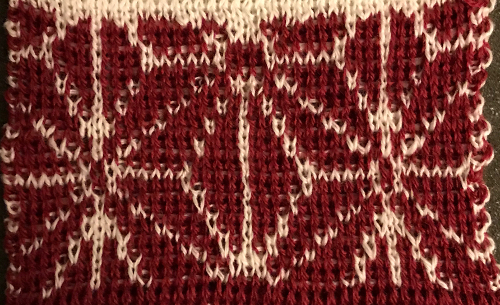 It may not matter with patterns with shorter spans worked between the 2 colors. 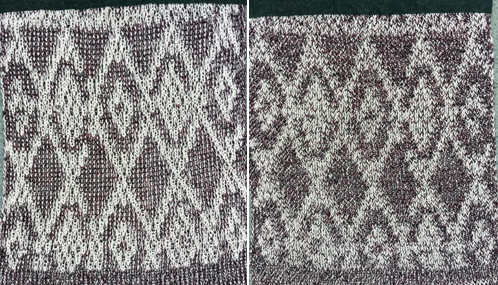 The dropped stitch issues below were resolved by using different yarns, no other changes. 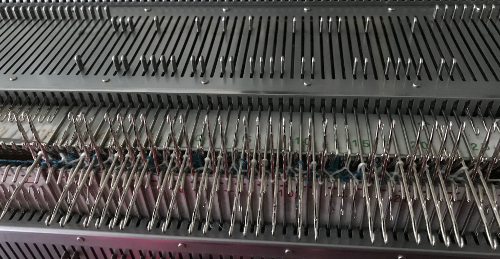 For DBJ that reverses ground and pattern colors, opposite needles are selected on each bed. 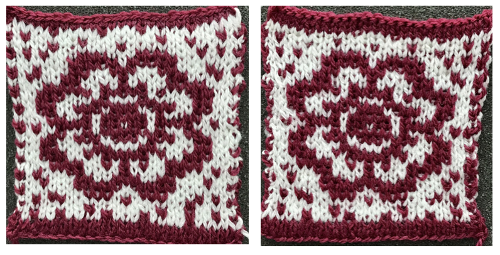 Color 1 knits the design on one bed and the background on the other at the same time, while color 2 knits the reverse. There are no floats. I knit this fabric as well at half pitch. The ground color created pockets (white squares), with the pattern color (black squares) locking the layers of fabric together. Here again, first and last needles on the ribber were worked on each row. I began pushing needles up on the ribber beginning to the right of each needle in work on the main bed. 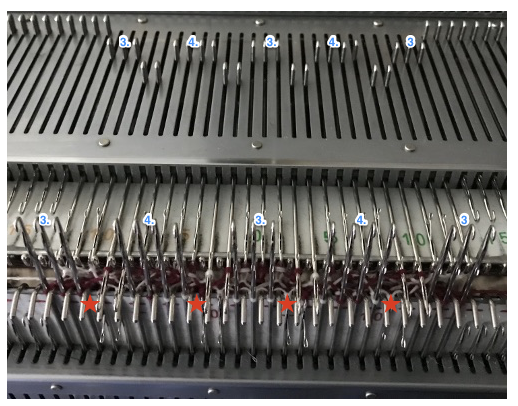 Needle selection on ribber matches unselected needles on main bed (pink). All needle positions each bed are mirrored. Since ribber fabrics are not visible for a large number of rows, I frequently scrap off after short distances to proof technique before committing to longer pieces as well as to asses whether the effort is worth it in order to produce the fabric in that particular technique or yarn. 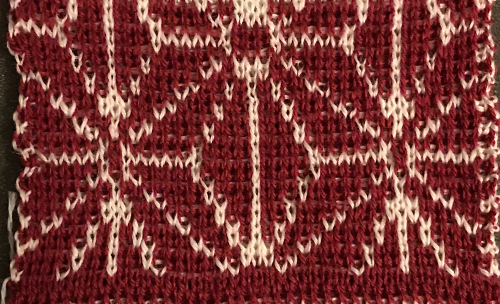 Moving on to a self drawn pattern, the technique proved to be sound. On inspection however, I saw I was actually missing a pixel in the .bmp I downloaded, and on the reverse the green arrow is most likely operator error in needle selection. 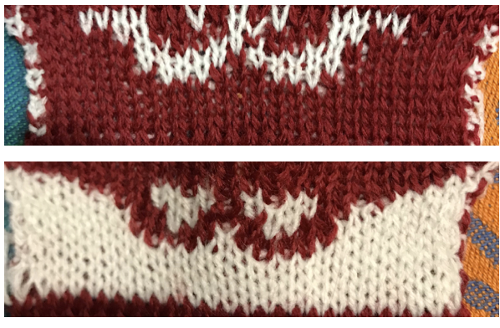 The orange dots highlight the missing pixel/contrast color stitch, and on the color changer side I had a really sloppy edge that needs sorting out (red dots). 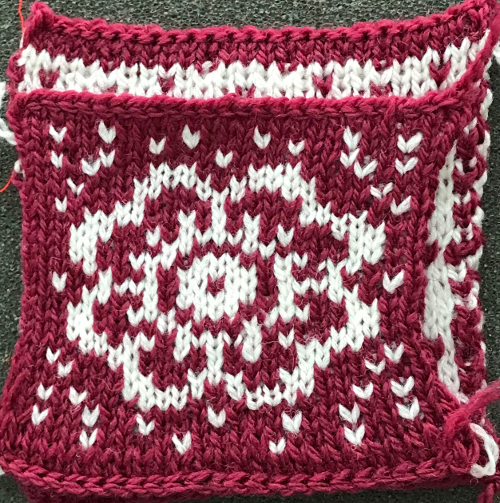 A possible added factor: I knit the motif using KCI, and later recalled end needle selection does not always work with the carriage I am using. Here I filled in the missing pixel, and drew a single pixel black line along each side, testing a “border”. The first and last needles on each side were now cast on and in work on the main bed. Still pondering those edges, and what about repeats with large areas of solid color? 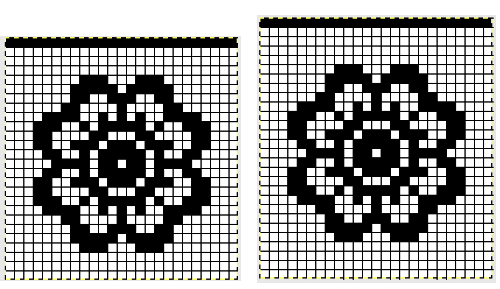 The image on the left is 25X26 rows in height, the one on the right adjusted for an even number of solid color rows, and a total row repeat divisible by 4, 25X28. 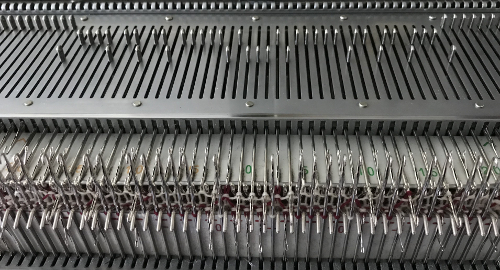 The single black line at the top is a marker for returning the carriage to all knit when the top of the repeat is reached. When using full pitch, solid areas remained open at both edges with carriage set to KCII. A wooden tool handle is actually inserted through from one side to the other in the bottom of the swatch. Because the needles are point to point, no extra needles could be brought to work on both ends as a work around. KCI will select end needles on main bed. I tried that as the first work around to seal the edges. 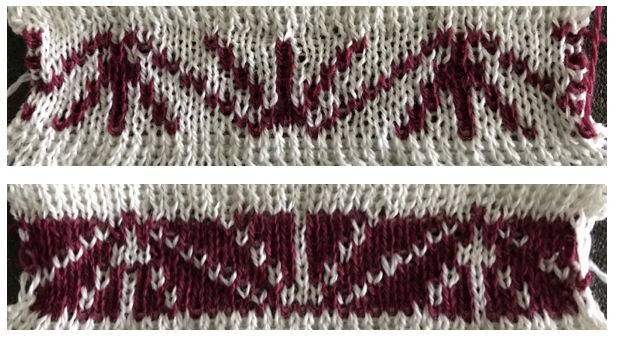 I paid no attention to whether needles were selected at each end every row, and got another creative pair of edges. Returning to half pitch I brought up to work the first needle on the left every row (too many rows at seen at R top edge compared to other side) and pushed the last needle on right up to work if it was not part of the group to be brought up to E. Analyzing the fabric structure in those areas of solid colors on alternating beds: at first full pitch makes sense if one has knit tubular stripes or solids which have closed edges, with the yarn making a single pass on each bed, traveling back to the color changer, with the option to stripe every X, even number of rows. Such stripes occur evenly spaced and identical on both fabric sides. Here the goal is to knit the fabric with large blocks of solid, alternate colors on each side. The main bed knits color 1 on selected needles on the top bed only, the alternate color is knit with the ribber needles being hand selected up to E while the main bed is slipping, with none of its needles selected. Other than that first set up row with preselection from the left, 2 rows are knit in color A, followed by 2 rows in color B. There are no stitches traveling between the beds to seal the fabric together in those areas, creating open sides, so if the goal is to have the edges seal. other steps need to be taken. A single pixel solid line along either edge of the repeat did not create a good edge. Full pitch is easier than half pitch to manage. One possible solution to both issues is to alter the side edges of the design repeat so there will be alternating needle selection along those side edges, thus sealing the fabric. 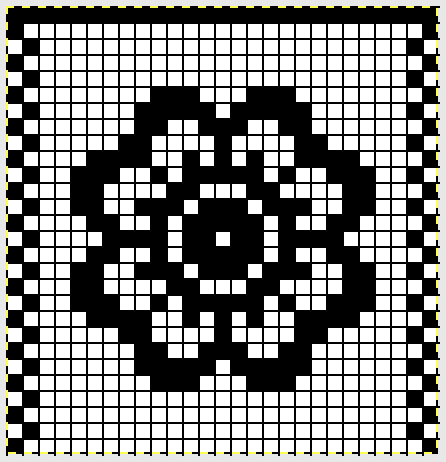 I decided to cast on with white, and to continue with white as the first color used in pattern (white squares in chart). This swatch was knit in full pitch. Edges are sealed throughout. The only hitch was when the top was reached and that all black squares row was reached. I was on the right at that point, with my dark color in the feeder. The row toward the left would have knit in the dark color instead of the white on the top bed. 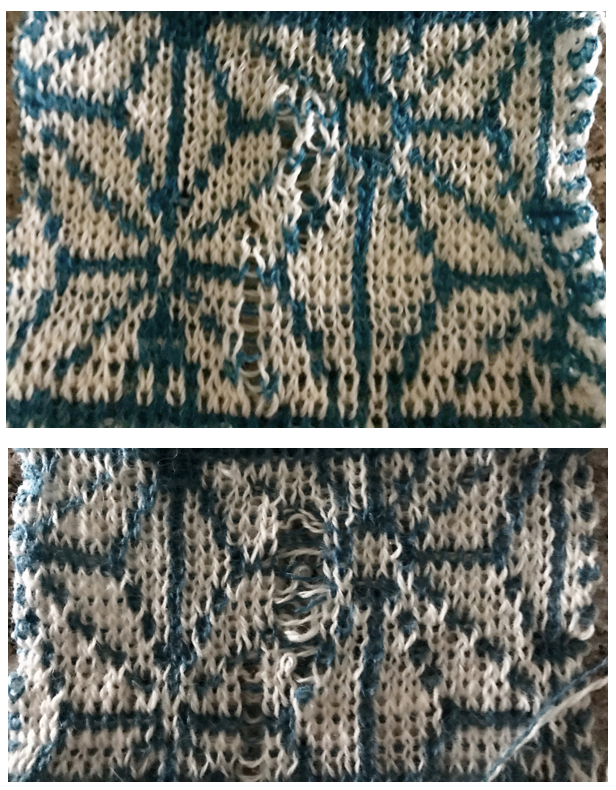 I cut the dark yarn, made a free pass to the left, continued in plain knit in white to right, and then transferred stitches and bound off. Top and bottom edges /borders in terms of number of rows, whether to add pattern there as well, are all subject to personal preferences and taste. Fascinating! This is, by far-and-away the most extensive exploration of this subject I have ever seen. I have done a very small bit of experimenting, but never anything close to this much. I think I only tried the method of selecting needles on the ribber that represent those NOT in UWP on the main bed, resulting in one side that is a negative of the other. Can’t remember whether I used half-pitch or not, but so interesting to consider that WITH THIS METHOD you could do it either way. 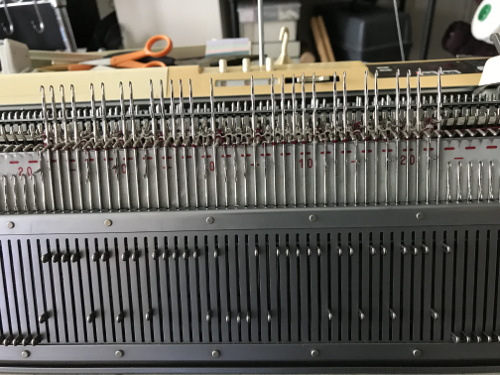 I never tried the method of selecting the SAME needles (shifted by half pitch) on the ribber that are selected to UWP on the main bed, producing a fabric that has the SAME design front and back, but with long floats through the ‘pockets’. More ‘to do’s’ for my list. Thanks for this fun brain exercise! Previous Previous post: Two color dbj, non repetitive images, electronic kms.